Following his emergence as new Chairman of the Nigerian Union of Journalists (NUJ) Kaduna State Council, Alhaji Adamu Yusuf of the Federal Radio corporation of Nigeria (FRCN) has unveiled his grandiose plan for the council which include bringing together every qualified journalists under one peaceful umbrella among others. 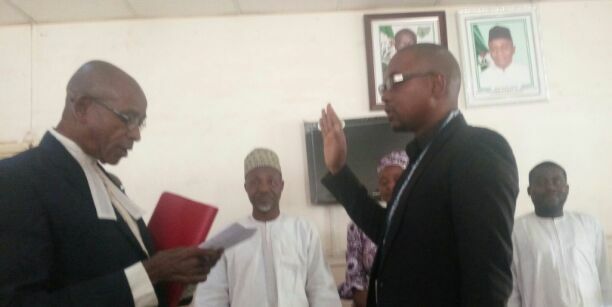 Yusuf who until his election as Council’s Chairman was the former Chairman of FRCN chapel, emerged as the only candidate who vied for the vacant position following the impeachment of the former Chairman Comrade Garba Muhammad few months ago. Addressing colleagues shortly after his inauguration in Kaduna on Monday, the new chairman said, it will be priority of his leadership to ensure optimal peace and sustained unity which ascertain the philosophical underpinning of unionism. According to him, “I intend to set up a reconciliatory committee which will be mandated to reconcile all those who felt aggrieved in one way or the other in the interest of the council. “Similarly, my leadership will make strident efforts to ensure discipline between and among our esteemed members. Gone are the days when someone attends a function as journalist with slippers. Gone are the days when when a reporter will appear drunk or dirty in the oace of work and elsewhere. Gone are the days when when a reporter will uses social media to abuse the ethical and pragmatic values of our dignified profession, especially doing so without valid facts or figures. “Henceforth, any form of improper dressing to assignments and every activities of quacks will be appropriately checkmated”, he reiterated. He then solicited for prayers and support from the members as he pilot the affairs of the council between now and the next council elections in 2018. Earlier, the Chairman, Credentials Screening ‎Committee and a former council Chairman, Mr Andrew Fadasan upon presentation of certificate of return to the new chairman after taking the oath of office and allegiance, charged him to uphold the ethics of the profession and the constitution of the union.